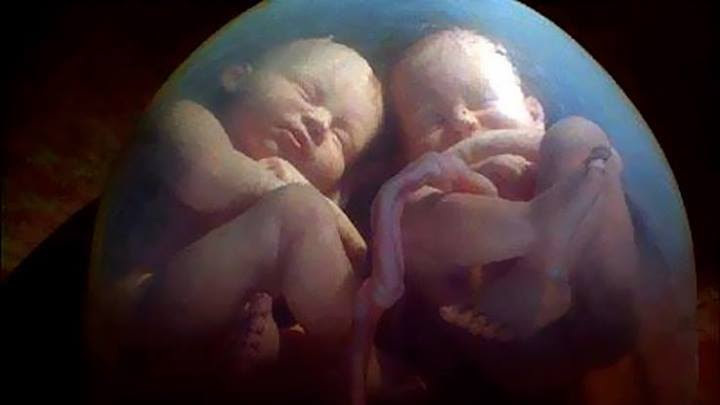 A human being is a multidimensional being. A human being lives in multiple dimensions. He has several faculties working in him. He is a sensory being, an emotional being, an intellectual being, a creative being, an aesthetic being and also a spiritual being. Human being utilizes and expresses his different faculties within himself, with his relationships, with larger society and also with rest of the nature. Animals on the contrary, do not have all these faculties awakened. For an animal the scope of exercise of faculties is fixed by nature. An animal knows what to eat, what not to, when to sleep, how much to sleep, when to mate, what to fear, how to relate with other animals and rest of the nature. They are hardcoded with this knowledge by the nature. Human beings on the other hand are not hardcoded with this knowledge. They are supposed to explore and know whatever is. When they “know” how to live, they live well, when they do not know it, their living go haywire. Human beings have free-will which animals do not. The idea of free-will comes from the constitution of a human being that a human being has capability or freedom to believe something about himself, to believe something about other human beings, to believe something about society and rest of the nature. Not only this, a human being also has the capability to act according to his beliefs. To believe and to act according to those believes are unique properties of a human being, which are not seen in animals. If we notice then the effort of entire formal or information education, religion, spirituality is to set the beliefs right. When beliefs are human beings are “wrong” then it creates several problems at the level of individual, inter-personal relationships, society and rest of the nature. When they are “right” then those problems seem to be getting solved. I will touch upon the ideas of “right” and “wrong” believe later. Following are various problems which we see at different levels of our living currently. 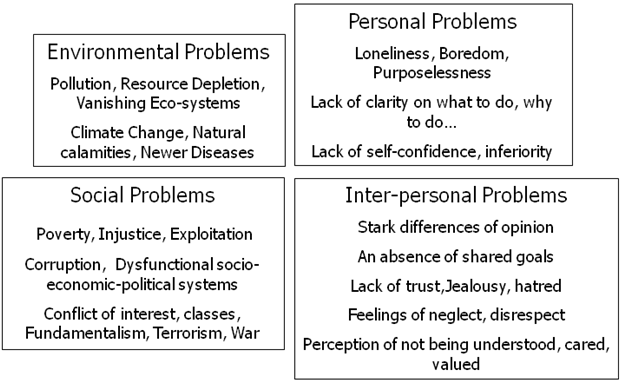 While the compartmentalization of above problems could suggest as they are disjoint, though it is important to realize that all these ‘types’ of problems are inter-affecting, interacting, and inter-related. One often leads to the other and vicious cycles manifest. If we notice then almost all of the above problems are human created problems. Animals and rest of the nature have no role in creating them. If we try to understand the root cause of all the above problems then it will turn out that they are the manifestations of lack of understanding at the individual level. What an individual believes reflects in his own conduct and in his relationships. What people together in a group believe reflect itself in the larger society and rest of the nature. Thus, we can safely conclude that lack of understanding at the level of individual is the root cause of all the problems which human being has created for himself, others and rest of the nature. Lack of understanding itself manifests itself in the form of “wrong” beliefs at the level of individuals. Following flow chart further elaborates how lack of understanding or “wrong” beliefs at the level of individuals is the root cause of all the problems which we see in the world. Each human being by design has this innate need for lasting happiness. All our desires, thoughts, behaviors and works are directed towards ensuring lasting happiness, whether we know it or not. We may not get happiness as an outcome of our endeavors but our intention is always for lasting happiness. To ensure lasting happiness for ourselves we have certain belief system. 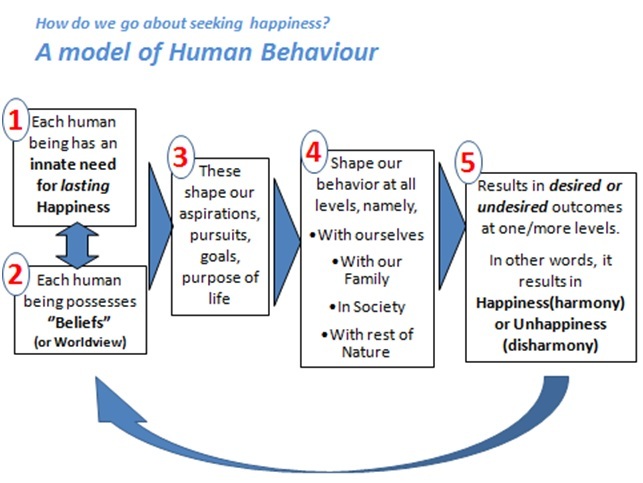 We believe that by intending, thinking, desiring, behaving, and working in a certain manner we will be able to ensure lasting happiness for us. Our beliefs about ourselves and life in general are the basis of our aspirations, pursuits, goals and purpose of life. Our beliefs and our conceptualized goals, aspirations in union shape our behavior at various levels of living i.e. with ourselves, in our inter-personal relationships and family, in the society and with rest of the nature. We obtain certain results as outcome of our behavior at various levels. These outcomes may match or may not match with our conceptualization of expected/desired outcome. If the results are in coherence with our conceptualization of expected outcome then we reinforce our beliefs and conceptualizations and if the results are not in coherence with our conceptualizations of expected outcome then we alter our beliefs and conceptualizations. This is how we keep living. Make beliefs, act, if the result is desired then reinforce belief otherwise alter the belief and again act. If one tries to understand the flow chart above then once can easily see that the root cause of all the problems as per the flowchart above lies in Box #2. Since the beliefs are “wrong” so the outcomes are undesired and unexpected. One can also easily see that the intention of all the individuals is always good, that is to ensure lasting happiness for themselves as well as for others, since disorder at other levels also affects one’s happiness. Problem lies in the lack of understanding of how order or happiness can be ensured at all the levels of our living. My proposal is, in order to ensure right beliefs, there is a need for right kind of education, which involves understanding the Self, Relationships, Society, Nature and the entire Existence in the connected and Holistic manner. Knowledge is an Obstacle to Knowledge!